Nick Colacchio is one of Grassroot Soccer’s biggest supporters. Ever since he decided to spend 2005 volunteering for GRS in Botswana, Nick returned to be one of GRS’s biggest advocates and supporters, most recently running on the GRS NYC Marathon team. Nick is currently finishing up Medical School in New York City, while remaining at the heart of the Grassroot Soccer family. 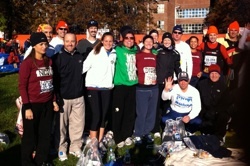 The following is a Nick’s recap of his 2010 NYC Marathon experience. Click here to read more about Nick’s experience with the power of Grassroot Soccer. GRS NYC Marathon Runners Nick Colacchio (left) and Brian Stater (right) pose before running on Nov. 7th, 2010. I am ecstatic to report that with your support yesterday I finished and survived my first (and perhaps last) marathon! Thank you so much again for your contribution to Grassroot Soccer and our fight against HIV/AIDS in Africa, and for otherwise supporting my run! I was so moved to have you 99 donors help me raise over $5,000 to contribute to the Grassroot Soccer Marathon Team goal of $200K! Thank you!!! The day started with a 5am wake-up, a groggy/anxious bus ride with the whole Grassroot Soccer team (~50 of us!) out to Staten Island, and then a couple hours of stretching, pacing, shivering, eating, drinking, visiting the port-o-potty, photos and video interviews, tooting our Vuvuzela, making colorful name tags, and bodypainting (or Sharpie-ing) as we waited for the race to begin on a perfectly clear though crisp November day. Eventually, after joining our respective starting corral among the 45,000 other marathoners, we took off across the Verrazano bridge with Manhattan in the far off distance to our left. In short, the next several hours provided periods of exhilaration and inspiration oscillating with those of pure exhaustion and excruciating pain. Despite the collective warning of every prior marathoner in history, a couple of fellow Grassroot Soccer runners and I couldn’t help but overindulge in the festivities for much of the first half of the race, hamming it up for the fans, and generally just running way to fast. It surely wasn’t the best for our ultimate time (nor our subsequent body pains), but there are no regrets, as we will never forget all the exuberant kids hands we slapped, the bands we danced for, or the fans on the far side of the streets we ran by to show our gratitude as they called out our names and chanted “Grassroot Soccer”! The GRS Marathon Team huddled together to stay warm before the race. Unfortunately, though not surprisingly, our antics did catch up with me a bit, and I started to cramp up around mile 14… oops! From here out I/we had to focus a bit more on ensuring our completion of the race, particularly because the dreaded Queensboro Bridge was upon us. It was readily apparent the toll this mogul took on all runners, as many became walkers, and others had to completely stop and stretch. We continued on and summited the bridge, and on the descent gradually began to hear the rumble of Manhattan beckoning us not to give up. As we rounded off the bridge to turn onto 1st Ave – again taking the turn wide to be the sole runners greeting the overzealous fans on the far side of the course – we embarked on a scene as close to rushing out of the tunnel for the World Cup Final, or SuperBowl Sunday, that I will ever experience. It was absolute pandemonium! At our feet as far as the eye could see was straight road lined with hundreds of thousands of roaring fans! On both sides of the street the fans were packed at least 6-15 deep for miles ahead, donned in festive attire, enjoying their favorite (and perhaps non-traditional 😉 Sunday morning beverages, and unabashedly cheering for the strangers passing by. It was truly awe inspiring. Things started to quiet down as we got up into East Harlem, but my ever-supportive parents and one of my sisters, brother-in-law and two infant nephews were there to pick us up at around mile 18.5! After that, the several miles making the loop into the Bronx was definitely the most challenging as we started to hit “the wall”, and my entire body seemed to want to go into total spasm and reject whatever torment I was sentencing it to. I had previously stopped to stretch a few times, though stopping only seemed to make things worse. At times it felt like we were in this lightheaded, tunnel vision daze, frozen in time, a dreamworld, and like my legs were not even moving – I actually remember purposely looking down to confirm that my reddened, swollen and cramping legs were in fact not stuck stiff, and I was actually still running. With the steadfast support of my running mate (fellow Grassroot Soccer marathoner and one of my best friends in medical school, Brian Stater) we pushed through and eventually found ourselves back in Manhattan headed down 5th Ave, where the density and intensity of the fans began to pick us back up. After leaving the raucous party going up 1st ave and seeing my family at mile 18.5, the only thing that kept me going was knowing that I was doing this for Grassroot Soccer, and that the Grassroot Soccer FanZone was eagerly awaiting us around mile 24. With the unwavering support of the thousands of fans, Brian and I left 5th Ave and entered Central Park where we near frantically sought the Grassroot Soccer FanZone, as we had largely felt that this was our finishline! We found our Grassroot Soccer Family there ready to greet and congratulate us in a quick flash, and to give us the final boost we needed to finish the 26.2. The last couple miles were without question the longest I have ever run. But Brian and I fought to enjoy the final strides, and to again rouse the crowd’s cheers, as we crossed the finish line together at 3:40:31. The whole Grassroot Soccer Marathon Team is still processing this amazing experience, and will surely feel the soreness for several days to come. But I want to again express my sincerest gratitude for your generous support, as Grassroot Soccer’s mission, methods and people all mean a great deal to me! 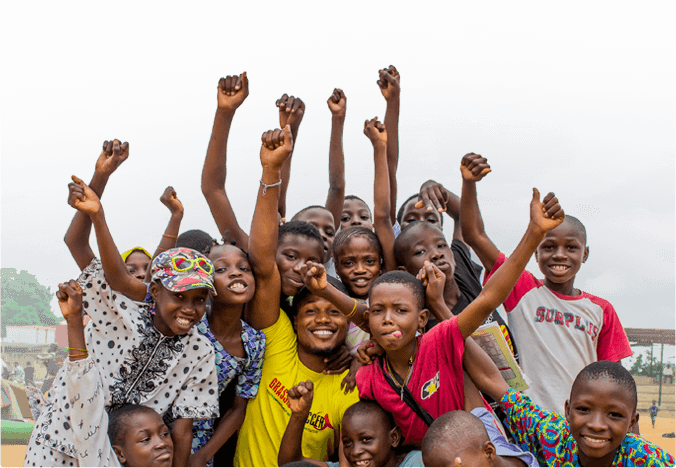 I hope that you feel personally invested in our work to save the lives of children in Africa as a member of the Grassroot Soccer Team.